Dear Readers...The RV Industry has a long history of being a proponent of RVing for literally everyone who wishes to enjoy the RV lifestyle. Though this article was originally published back in March, it's worthy of another mention here. Kudos to RVShare and RVAG! Enjoy! The ability to take an excursion to one of America’s many campgrounds in an RV is something many people take for granted. 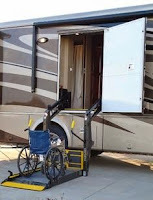 But for the physically challenged, there are serious obstacles to embarking upon such a trip starting with the fact that there are few RVs for rent that can meet the needs of this group. But now a unique partnership between Fairlawn, Ohio-based RVShare and the nonprofit organization RVing Accessibility Group, Inc. (RVAG) is offering a solution to this problem by connecting owners of accessible RVs with renters. The two have different objectives, but they have one important thing in common, a love and appreciation for RVing. It was during a November 2014 trade show in Las Vegas that RVShare owners Mark Jenney, Joel Clark and Patrick Couch got their first glimpse of the uphill battle facing physically challenged individuals who want to take their vacations on the road. 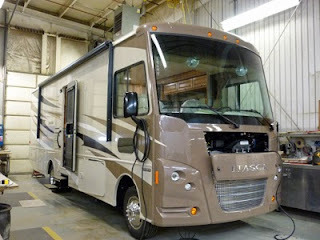 Finding an accessible RV is only one part of the equation; the other is the campground itself. Jeff Sims, director of state relations and program advocacy for the National Association of RV Parks & Campgrounds, said his trade association works with members to help them understand and comply with Title III of the Americans with Disabilities Act. “We have developed a self-evaluation form for Readily Achievable Barrier Removal for Priorities 1 through 4 and the recreational checklist for swimming pools, wading pools and spas,” said Sims. Priority number one is the approach and entrance, followed by access to goods and services, toilet rooms and additional access, he said. “Not everything on the list is readily achievable but we encourage members to have a transition plan in place.” In terms of making campgrounds accessible, he said owners have to start at square one from the moment the person pulls into the park’s entrance, attacking the accessibility issues each step of the way, including the office, store, pool, playground, common areas and restrooms. “People think that as long as a restroom is near the campsite, it is accessible,” said Sims. “But there is more to it. The person must be able to get through the door with the wheelchair and fit into the stalls.” Some things, such as making the trails available, are even more challenging he said. Sims said this will happen in the future but the industry is doing its best to embrace the changes now based on the United States Access Board’s new Standards for Outdoor Developed Areas. He said these standards currently only apply to national parks and other outdoor areas developed by the federal government. However, Sims said the U.S. Access Board intends to develop guidelines for non-federal outdoor sites covered by the Americans with Disabilities Act under Title III.